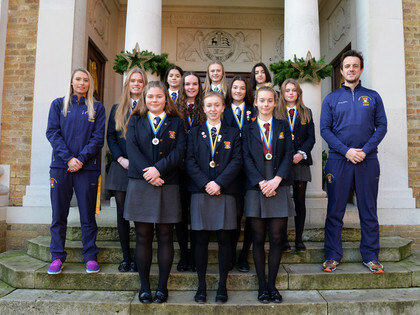 On Friday 11th January, the U16 Girls' Hockey Team travelled to Bromsgrove School in preparation for the National Hockey Finals taking place on Saturday 12th – Sunday 13th January. The squad had trained hard over the Christmas period, coming into school on five occasions to give them the best chance of success at the finals. With a session with Andy Halliday (GB Ladies Indoor Head Coach and current GB Men’s Manager) in the week leading up to the Final,s the players and coaches were confident of producing a stellar performance. We were drawn in a tough group with perennial powerhouses Repton and Millfield alongside St Georges, Weybridge and Queen’s Chester. It was testament to the quality of the tournament that all teams had at least one England player and numerous Futures Cup and Performance Centre players were on show. In our first game against Millfield we came under lots of pressure in the opening exchanges and Millfield took the lead early on from a powerful flick from a penalty corner. Resolute defending from the entire team and some exceptional goalkeeping from Lizzy T kept the score line at 1-0 going into half time. With some positional adjustments in our press and with confidence that we could compete with Millfield, we took to the court with improved intensity. We were unlucky not to be awarded a penalty flick when Imogen S was impeded by the Millfield keeper and, despite having a lot of possession, we could not find the killer pass to create some goal scoring opportunities. With a loss in the first game it was imperative that we finished the day with victory in the last game of the day against Queen’s Chester. After a lengthy gap between games where the girls managed to watch a high level and high drama U18 National Final between Trent College and Repton (Trent won on sudden death flicks!) they knew it was make or break. The team started with a full press and forced Queen’s into a number of turnovers and opened the scoring through Tabby B, in just the second minute. We laid siege to the Queen’s goal but just couldn’t score that crucial second goal through a combination of rushed finishing and some good goalkeeping. The second half continued in the same manner with Lana V, Georgia W and Dara S thwarting any sporadic attacks and Emelia M and Imogen B feeding the forwards of Imogen S, Tabby B, Clodagh R and Issy S to take numerous shots on goal. Nerves were finally settled in the final minute of the match when Imogen B tapped in from close range to secure a 2-0 victory. The second day saw us open up against Repton. The girls were extremely focussed before the game and competed very well in the opening exchanges of the match. It was therefore somewhat of a surprise that Repton took a 2 goal lead after 6 minutes. The College deservedly pulled a goal back before half time through Imogen S and the talk at half time was how to take the game to Repton and not let up. The fourth goal of the game was crucial and, unfortunately for the College, it was Repton who scored it which left the girls somewhat deflated. Repton added a further 2 goals but to the girls’ credit they did not let their heads drop and scored a second towards the end of the match through Tabby B. Unfortunately the loss to Repton and Millfield’s victory over Queen’s meant that we were unable to qualify for the semi-finals; however, we still had the chance to finish third in the pool and achieve a top six finish in the country. Our final game against St George’s was an end to end affair and a 2-2 draw, whilst unlucky, conceding a last second equaliser, was probably a fair result. Goals were scored by Imogen S and Imogen B. The girls were a credit to the College and should be thoroughly proud of their achievement in finishing joint 5th in the country. Their commitment and dedication shown, not only in the autumn term, but during the holidays, is a credit to them and it has been an absolute pleasure coaching them this year.